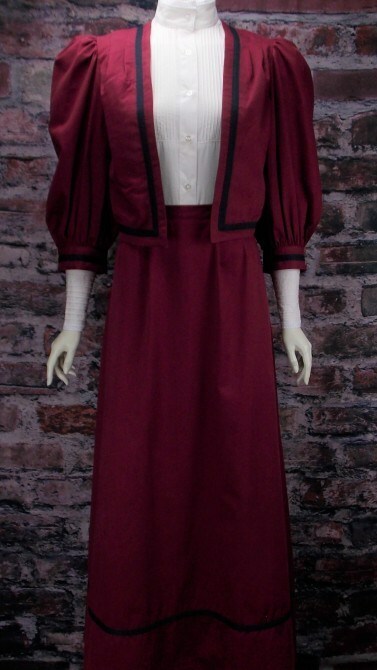 This Ensemble Is Fashioned From Burgundy Cotton With Black Trim. Our Two-Piece Suit Features A Fully Lined Jacket With ¾-Length, Full Sleeves Of The Era. The Skirt, Lightly Tucked On The Waistband, Falls 40 Inches Straight To The Ground Allowing A Practical Range Of Movement. Made From Cotton. Offered In Several Colors And Fabrics To Suit Your Needs And Style. Skirt Measures Approximately 40 Inches In Length. Dry Clean Only.